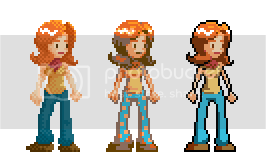 This is my most recent sprites! Done a couple of months ago at work. It was just a thing for fun though, not for work, done during some spare time between projects. I'm really rusty since it has been more than a year since my last pixel art. I really wasn't able to add in more details, specially her face, had some trouble with her expression (or lack of). Anyway, tips and critiques are welcomed! @onek WOW! Thank you for the critique and the edit! I was really kinda lost before but now I have some very solid directions in which to work on and imporve! Thank you very much! I don't know if I'll be able to edit this sprite, but I'll definitly apply this on future works! By the way, is there a tutorial in particular that you recomends from the list of tutorials here on pixel joint? ur animations are really nice, the sprite itself looks also pretty good but ur stuff is lacking pixel level control. u make the typicall beginner mistake of overdithering everything... all the dithering creates unwanted grainy textures, and u certainly have enough color to make smooth transitions without using dither. ur colors lack contrast and are hard to distinguish.